Kirito, Asuna, and many others from the Aincrad incident have survived an unbelievable ordeal. The recent Gun Gale Online debacle raised further concerns, and the loss of a dear friend still stings. But life goes on. Their time within the death game they knew for so long is just about a faded memory, a forgotten nightmare at this point. Ordinal Scale, then, seeks to undo this trajectory. Representing the first true film for the franchise, this next leg of the race has this divisive series moving away from VR for the moment as AR becomes all the rage. Using in-app utilities for health monitoring, keeping track of news. This powerful device of the future invites the populace with its technological wonders. And, of course, its video-game potential knows almost no bounds. These two preceding paragraphs are important; they establish the major direction of the movie from the get-go. The plot considers their harrowing time within that old game, reflecting on if such a negative experience can be counted as worthwhile or if it should even be remembered in the first place. Such a theme bolsters strength in the narrative. As for AR, it affects the situation inherently, for it is tied to the realer setup. Not only in the cityscape setting but also in the content being an extension of their physical and mental worlds. In the first half of the film, these worlds do a solid-enough job of forming the plot. It showcases Kirito and Asuna’s relationship and the promises they share, and it puts those cool fights front and center. Some slight comedic moments here, a few dastardly deeds there, and Yui tagging along all the while collectively craft for this anime a clear foundation. Fans of the series will appreciate many of the different inclusions from previous installments. Visiting Kirito and Asuna’s personal lakeside cabin. Interacting with side characters from both previous seasons. Encountering familiar enemies from days of old. 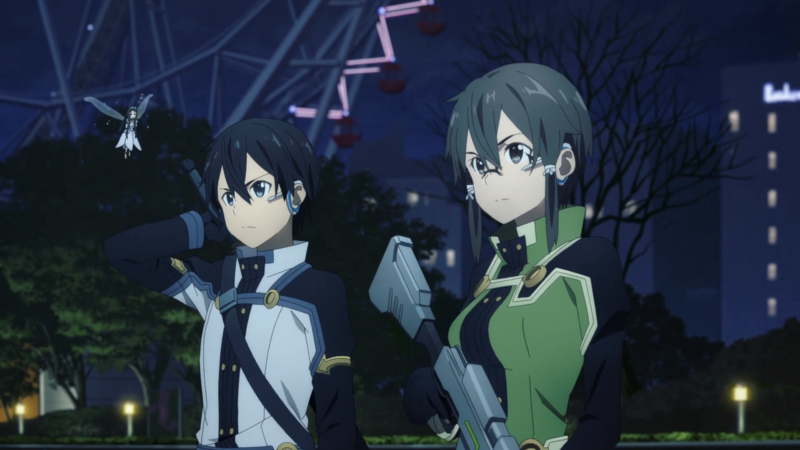 Ordinal Scale gives the audience some welcome callbacks that do not interfere with the plot but rather find a place naturally within its confines while also awarding the anime with some slick action sequences. 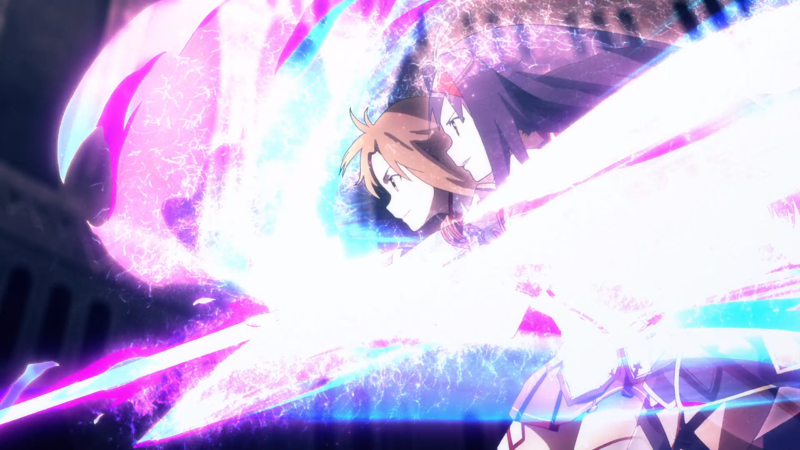 The second half more or less begins after Asuna suffers the same fate as some of her fellow Aincrad survivors. At this point, the narrative shifts gears as Kirito spearheads the charge of discovering the problems which surround them. Arguably speaking, the last quarter or so of the film ramps up the pacing to a zany degree. True to form, Kirito slices and dices his way through the bosses and the rankings, pushing the film to its overall finale event without much care. Furthermore, reading from a certain someone’s diary may be a bit too direct to get the message across, and the “doomsday clock” premise is a bit too obtuse. However, Ordinal Scale takes advantage of that earlier foundation, concluding these throughputs in satisfying fashion with romantic goodness and over-the-top brawling aplenty. The film doesn’t achieve much else, though. While Kirito voices a few musings about AR, the concept and the comparisons with its VR counterpart rarely surface. Troubles with the underlying mystery and how it isn’t exactly the most enthralling subplot imaginable also pop up now and again. Even so, Ordinal Scale delivers on what the Sword Art Online franchise has been built upon. Mixing the real world and the fantasy world. Neat battles. A mainstay couple at the helm. Sure, it is far from the most intriguing or the subtlest story around, but it at least provides a consistent, likable experience for the two hours-ish it demands. Films tend to take on a higher caliber of visual splendor. Be it because of the smaller runtime affording better scheduling, the extra resources pooled into such ventures, or the theatrical venues in which they appear, reaching that “Wow!” factor becomes ever easier. Ordinal Scale follows suit with impressive artistry, indeed. Standing out most within the movie are those all-important battles that Kirito, Asuna, and the others wage throughout the story. It spares no expense: colorful explosions, multiple camera angles, crazy abilities, huge scales, nicely choreographed moves. These awesome fight sequences highlight the film at its best, letting the audience absorb such animated treats with ease and expertise. These fights commence in and around Kirito’s nearby city. Recalling the AR nature of the movie, the refined details for the buildings and the parks as well as the grounded view in general equate to a hefty amount of realism which sets the stage alight. 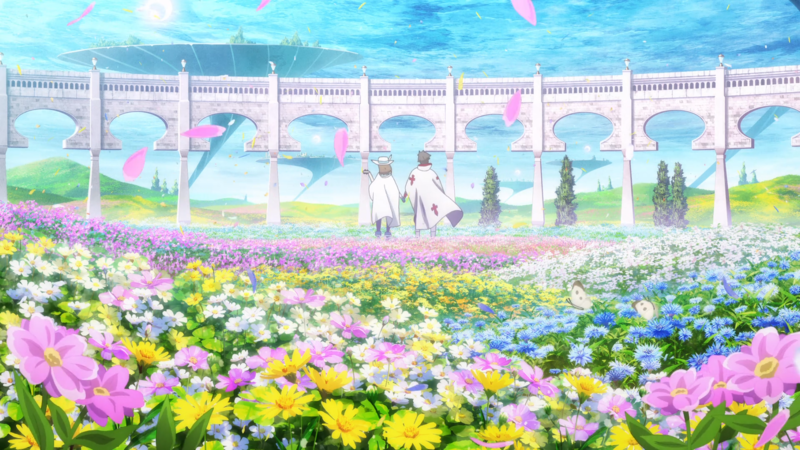 Of course, Ordinal Scale incorporates the opposite end, morphing the playing fields into reimagined states of Aincrad’s various environments and even visiting it directly on at least one occasion. The film also stays mostly within the nighttime hours for a gloomier atmosphere which mirrors the misfortune that permeates the air. As such, lighting and shadowing tend to be well-composed, too. And (perhaps expected) the character designs remain as crisp as always. Switching between casual clothes, their ALfheim Online looks, and their newer futuristic gear likewise increases the movie’s overall artistic clout. Certain shots, such as a top-down first-person perspective of Asuna or an up-close frontal view of Suguha, can come off as feeling too on the nose in terms of capitalizing on apparent popularity. However, these scenes don’t outright ruin the movie, and they instead fall under that continued category of creating a fun experience for fans of this franchise. It can be tough to develop people in a story who have gone through so much already, but Ordinal Scale does what it can to make it happen anyway. 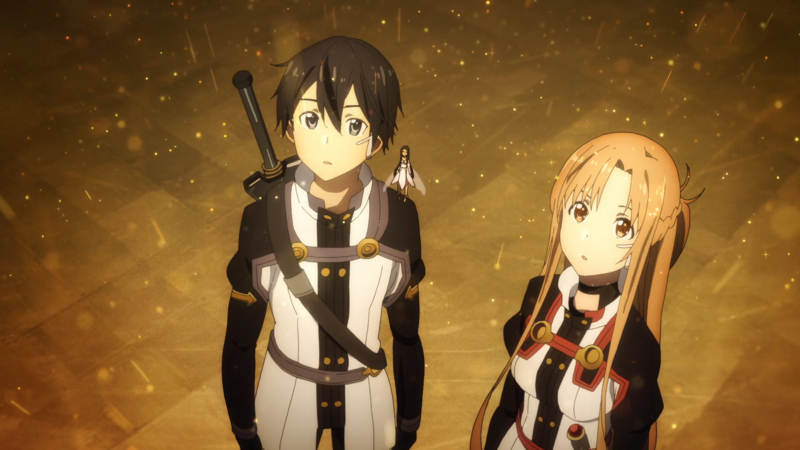 At the minimum, the anime takes some extra time to explore Kirito and Asuna with increased focus on them and their connection. 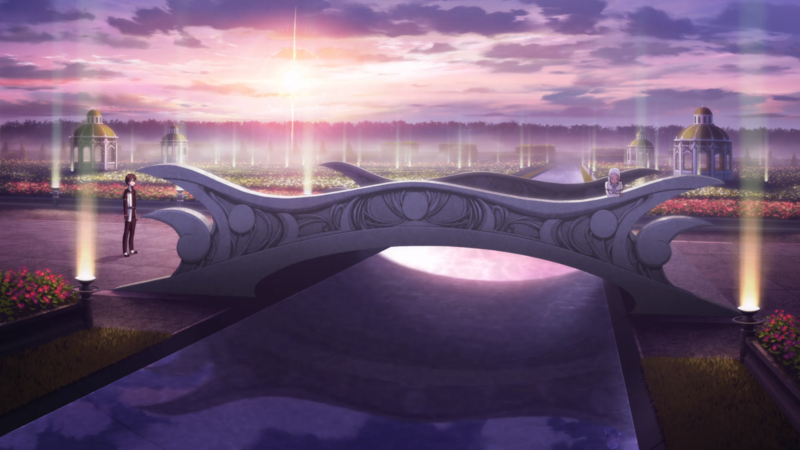 While the first season of Sword Art Online placed a sizable amount of attention on them (either together or in their feelings for one another) within the first season, the second season went in multiple different routes with other stories and newer characters. So, seeing a (in a way) return to form comes as a welcome surprise. Granted, not that anything drastic or huge changes or grows between them. They are already a bona fide couple after all. But having the film return to their relationship in earnest showcases a deeper look into Asuna’s feelings and forms the major driving force behind Kirito’s actions throughout this new film. This look-see, at the very least, makes for a solid aspect within the film. In fact, their bond hearkens back to the plot and the outcome of the tragic event they and so many others experienced. Whether those memories are best forgotten as painful or if those hardships matter because they define them for who they are now. Case in point, Kirito and Asuna have their fair share of troubling events, but they also shared many intimate moments they absolutely wish to hold dear forever. Individually, Asuna faces her own trauma head on. Complications force themselves upon her, yet she displays stalwart conviction and mental fortitude as she either trusts Kirito or fights back against her demons all on her own. Kirito’s arc fumbles a bit instead. He appears to have an interesting aside when the concepts of AR and VR differ in actual physical capabilities, putting him behind the others in his lax ways. That’s the extent of this line of thought, though, for he lives up to his storied self insofar as he catapults from almost useless to impossibly overpowered. Yes, Kirito (and indeed the series) just wouldn’t be himself if he weren’t wrecking the opposition, but it seems as if the film left this potential idea out of its scope. Besides the main couple, Ordinal Scale also provides its handful of prominent side characters with limelight as well. Klein succumbs to the evils at work, and he questions his own memories in turn. Sinon supports Kirito to let him know that he doesn’t have to go at these problems alone. Silica worries with guilt over indirectly causing Asuna’s current predicament, a subplot which goes without a ton of momentum but adds a small extra layer to the writing. Even Agil gets in on the action. Not to the same extent or purpose as the others, but he can be found swinging his weapon around like the best of them. Then the film falls apart again with its two newest characters: Eiji and Yuuna. 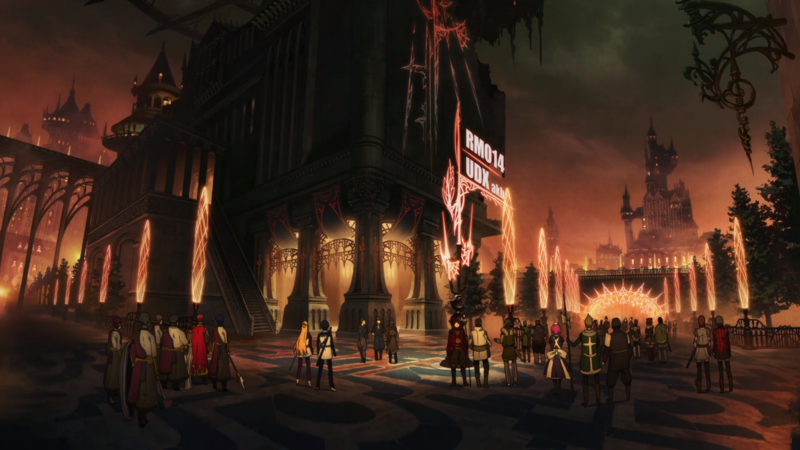 While they take on a somewhat morally grey position in terms of defending the “other” side of the Aincrad incident, they don’t receive as much attention as possibly required. The audience gets the gist of who they are and their meager relationship together, but the mini-flashbacks and the sparse, infrequent scenes with them fail to reach any worthwhile developments or outcomes in either an individual or pairing sense. It turns these two not into an intriguing antagonist or a pitiable soul but rather a couple of (ironically) forgettable characters. Looking at the other half of the production values, the audio elements within Ordinal Scale spice up the film with their own flavors. For instance, the voice-acting performances remain at a veteran level for most of the characters across the board. Yoshitsugu Matsuoka in particular delivers on his signature role as he interacts calmly and yells with fervor. The original soundtrack has many a foreboding tune and several intense pieces, improving the atmosphere and the power of its separate scenes. Yet it isn’t afraid to include some sentimental arrangements for those lighter or romantic moments. Not to mention the familiar tracks which ring in nostalgia as well, and the faux-insert songs from Yuuna that induce further intrigue. And the breadth of sound-effects throughout the battles deserve some recognition, too. The clashing of weapons. Monstrous roars. Gunshots. Magical spells. Specialized move sets and attacks. While Ordinal Scale ensures that the visuals for these battles provide an eyeful, it also complements them with an aural edge that boosts their efficacy. To play devil’s advocate, almost none of these elements leave a lasting impression or have an extensive finesse to them. Those VA performances don’t scream “incredible”; that OST hardly has any standout hits; these sound-effects may be expected or at least required given the subject and premise. Nonetheless, they contribute to the film’s overall success. Wanting to go into the third season of the franchise (which is currently airing as I type this out) without missing any of the major previous content, I took it upon myself to seek out this film before doing so. I don’t consider myself a mega-fan of this franchise, but I am not a hater either. I’m simply somewhere in-between. A person who likes it for what it is and finds its attempts at generating cool ideas around games and gaming worlds to be fun enough. Luckily, the same thoughts carry over into this movie, for I liked what it presented per usual. 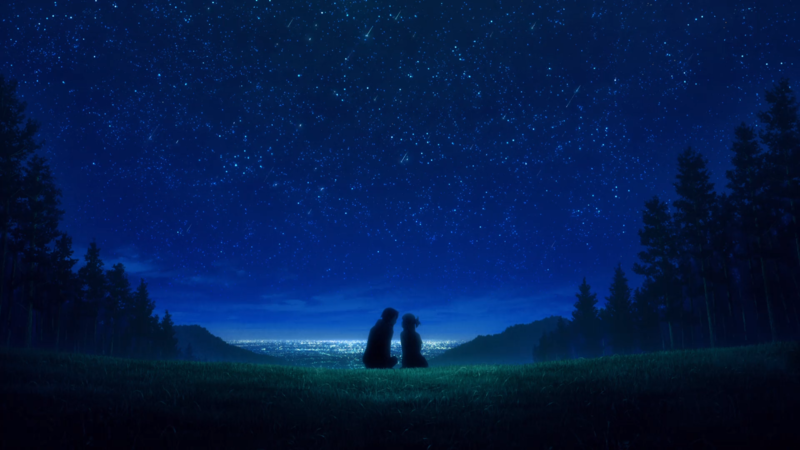 As a dude big on romance, my heart was all aflutter as Kirito and Asuna bonded over their feelings for each other. Those fight segments were fun to watch, too, as they went about destroying the enemy creatures and then worked in unison with almost everyone else for larger spectacles. Other parts had me interested as well. The comedy bits here and there, like when Asuna hurriedly backed away from Yuuna after winning again, had me chuckling. Yui’s enthusiasm in supporting her “parents” out whenever and however she could had me smiling wide. And, as always, Sinon was rad in her sniper-rifle ways, and Klein was a bro on and off the battlefield. Truth be told, I didn’t much care for the new characters, but it was neat seeing their downfall or their kindness in the end. I also wasn’t exactly floored by the film in total, but I liked it more so than I believed I would once I finished watching it in its entirety. So, in my eyes, it proves that the series still has that entertainment factor going strong even after all these years. Sword Art Online Movie: Ordinal Scale continues in its predecessors’ footsteps in a positive manner. 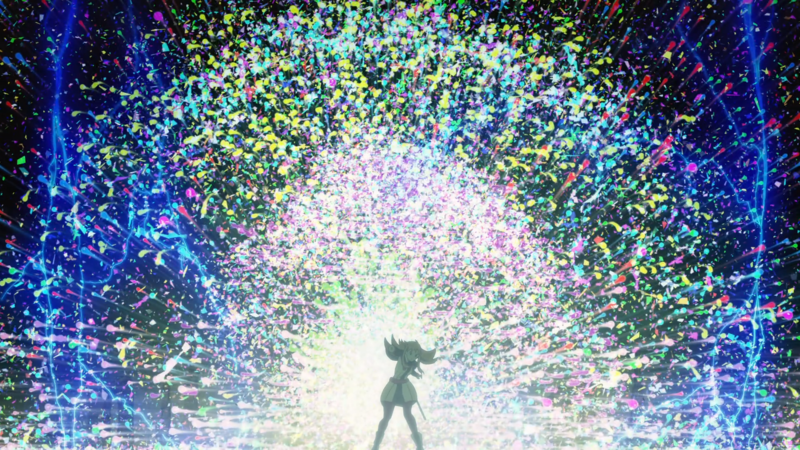 A lot of cool action and a swell artistic vision allow this anime to move forward even if parts of the writing and the musical direction merely pass the execution mark. Thus, technology aside, the whole project advances another step.